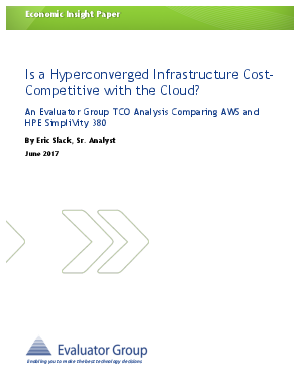 > Hewlett Packard Enterprise > Evaluator Group TCO Analysis: Is a Hyperconverged Infrastructure Cost-Competitive with the Cloud? It’s easy to assume that running IT apps on-premises is not cost competitive with cloud-based services. Evaluator Group tests the validity of that assumption with a TCO model analyzing a hyperconverged solution from HPE and a comparable AWS solution.